The National Party (NP) (Afrikaans: Nasionale Party), also known as the Nationalist Party, was a political party in South Africa founded in 1914 and disbanded in 1997. The party was originally an Afrikaner ethnic nationalist party that promoted Afrikaner interests in South Africa. However in the early 1990s it became a South African civic nationalist party seeking to represent all South Africans. It first became the governing party of the country in 1924. It was in opposition during World War II but it returned to power and was again in the government from 4 June 1948 until 9 May 1994. The NP first came to power in coalition with the Labour Party in 1924, with Hertzog as Prime Minister. In 1930 the Hertzog government worked to undermine the vote of Coloureds (South Africans of mixed White and non-White ancestry) by granting the right to vote to White women, thus doubling White political power. 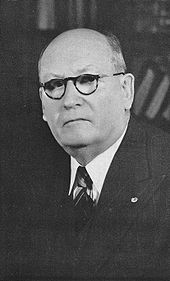 In 1934 Hertzog agreed to merge his National Party with the rival South African Party of Jan Smuts to form the United Party. 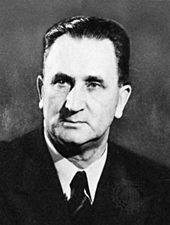 A hardline faction of Afrikaner nationalists led by Daniel François Malan refused to accept the merger and maintained a rump National Party called the Gesuiwerde Nasionale Party (Purified National Party). The Purified National Party used opposition to South African participation in World War II to stir up anti-British feelings amongst Afrikaners. This led to a reunification of the Purified Nationalists with the faction that had merged with the South African Party; together they formed the Herenigde Nasionale Party (Reunited National Party), which went on to defeat Smuts' United Party in 1948 in coalition with the much smaller Afrikaner Party. In 1951, the two amalgamated to once again become known simply as the National Party. Many English-speakers did not want to break their ties with the United Kingdom. However, in 1949, at the Commonwealth Prime Ministers' Conference in London (with Malan in attendance), India requested that, in spite of its newly attained republican status, it remain a member of the British Commonwealth. When this was granted the following year by the London Declaration, it roused a great deal of debate in South Africa between the pro-republican NP and the anti-republican UP (under Strauss). What it meant was that, even if South Africa did become a republic, it did not automatically have to sever all of its ties with the UK and the British Commonwealth. This gained the movement further support from the English-speaking populace, which was less worried about being isolated; and the republican ideal looked closer than ever to being fulfilled. The NP won 20.39% of the vote and 82 seats in the National Assembly in the first democratic elections in 1994. This support extended well beyond the White community and into other minority groups. For instance, two-thirds of Indian South Africans voted for the NP. It became the official opposition in most provinces and also won a majority in the Western Cape, winning much of the White and Coloured vote. Its Coloured support also earned it a strong second place in the Northern Cape. The party was wracked by internal wranglings whilst it participated in the Government of National Unity, and finally withdrew from the government to become the official opposition in 1996. Despite this, it remained uncertain about its future direction, and was continually outperformed in parliament by the much smaller Democratic Party (DP), which provided a more forceful and principled opposition stance. In 1997, its voter base began to gradually shift to the DP. The NP renamed itself the New National Party towards the end of 1997, to distance itself from its past. On 5 August 2008 a new party using the name of "National Party South Africa" was formed and registered with the Independent Electoral Commission. The new party had no formal connection with the now defunct New National Party. The relaunched National Party of 2008 pushes for a non-racial democratic South Africa based on federal principles and the legacy of F. W. de Klerk. ^ "The End of Apartheid". Archive: Information released online prior to January 20, 2009. United States Department of State. 2009. Retrieved 5 February 2009. 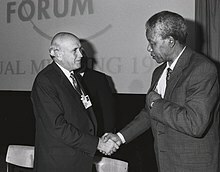 Apartheid, the Afrikaans name given by the white-ruled South Africa's Nationalist Party in 1948 to the country's harsh, institutionalized system of racial segregation, came to an end in the early 1990s in a series of steps that led to the formation of a democratic government in 1994. ^ sahoboss (30 March 2011). "National Party (NP)". ^ "The legacy of Indian migration to European colonies". The Economist. 2 September 2017. Retrieved 2 September 2017. ^ a b "Return of the Nats". National Party Press Releases. Archived from the original on 1 December 2008. Retrieved 25 April 2011. The National Party (NP) regrouped and reregistered with the Independent Electoral Commission (IEC) as a political party on all levels of government. The National Party reregistered as National Party South Africa (NP) and resurfaces as a mainstream political contender in post 1994 South African politics. ^ Evans, Ian (29 August 2008). "Return of the apartheid party". The Independent. ^ Smith, Janet (24 August 2008). "NP is back, itching for a fight". Independent Online.